The long and complicated story of the pipeline that was … and then wasn’t … and now might be. Pakistan has been trying for a while now to build buzz regarding Chinese President Xi Jinping’s scheduled visit to the country — a visit that was originally scheduled to take place last fall during Xi’s broader tour of South Asia, but was postponed due to nationwide protests in Pakistan. It’s still unknown precisely when Xi is meant to arrive in Islamabad. China is keeping a tight lid on the specifics. Earlier reports suggested a visit this week, but that hasn’t panned out. Current expectations are for something in mid- to late-April. Despite all the ambiguity surrounding the visit itself, Pakistani sources have reportedly blown the lid on one of the big deliverables: China will fund a long-stalled pipeline that would connect Iran and Pakistan, supplying natural gas from the former to the latter. A report yesterday in the Wall Street Journal outlined the terms of the expected deal, based on comments from Pakistani officials. During Xi’s visit, China and Pakistan will sign an agreement on a Chinese loan for Pakistan to make good on its 485-mile section of the so-called “Peace Pipeline.” Pakistan’s part of the project is estimated to cost around $2 billion. Islamabad is reportedly in the process of negotiating a deal with China Petroleum Pipeline Bureau, a subsidiary body under China’s massive state-owned China National Petroleum Corporation (CNPC) to build part of the pipeline. The cost would be $1.5 billion to $1.8 billion for the pipeline, or $2 billion if an optional Liquefied Natural Gas terminal at Gwadar is included in the scheme. Under the deal, 85% of the financing will be provided by a Chinese loan, with Pakistan coming up with the rest. The remaining 50 miles (80 kilometers), from Gwadar to the Iranian border, will be built by Pakistan. The pipeline, which would take two years to build, would eventually supply Pakistan with enough gas to fuel 4,500 megawatts of electricity generation—almost as much as the country’s entire current electricity shortfall. It’s worth noting that that the Iran-Pakistan border in Balochistan has grown increasingly unstable; the WSJ‘s report of China funding the pipeline came within 48 hours of reports that Pakistan-based Sunni militants affiliated with Jaish-ul-Adl had ambushed and killed eight Iranian border guards in Iran’s Sistan-Baluchestan province. The announcement came shortly after an Iranian diplomatic delegation, led by Foreign Minister Javad Zarif, arrived in Pakistan for a major bilateral meeting. As my colleague Shannon noted earlier this week, China is wasting no time in preparing for expanded economic relations with an Iran unencumbered by international sanctions related to its nuclear weapons program. After the announcement of a framework for a comprehensive agreement between the P5+1 group of powers and Iran in Lausanne, Switzerland on April 2, China is exploring every avenue of cooperation with Tehran. Although the meeting between Iranian representatives and their Chinese counterparts focused primarily on future investments and oil exports, it is likely that Beijing broached the issue of the Iran-Pakistan natural gas pipeline. This pipeline has, to put it mildly, had its ups and downs over its short but storied history. Color me skeptical of the two year time line presented by Pakistani officials; Pakistan may have better luck holding out for Godot’s arrival than the first drops of Iranian oil via this joint pipeline. However, if China does come out big and deliver after Xi’s departure from Islamabad, the pipeline will be an important coup for energy-starved Pakistan. Initial negotiations for a pipeline connecting Iran’s South Pars gas fields to Pakistan date back to the mid-1990s. Iran and Pakistan signed a preliminary agreement in 1995, and after that, the project fell onto the back-burner. In early 2013, Mahmoud Ahmadinejad and Asif Ali Zardari, the men preceding the current leadership in Tehran and Islamabad respectively, inaugurated the final construction phase of the pipeline after agreeing to jointly construct the Pakistani side of the project. Back in December 2013, the pipeline’s fortunes temporarily appeared bright, only to be shot down by Iran’s lack of patience for Pakistan. In a move designed to put some pressure on the United States, which was naturally against the pipeline, Pakistan indicated that it would “accelerate” the project. The announcement came shortly after former U.S. Defense Secretary Chuck Hagel visited Islamabad. Iran had announced that should Pakistan fail to meet a winter 2014 deadline for the pipeline, it would face a fine of $1 million a day until it met its obligations. A few days after Pakistan’s announcement, Iran fired back, expressing its frustration at Pakistan’s efforts: Tehran canceled a major loan to Pakistan that would have allowed it to theoretically complete the gas pipeline project under a mutually understood road map. Iran made the move after Pakistan’s Minister for Petroleum and Natural Resources Shahid Khaqan Abbasi attributed the Pakistani gridlock on the project to international sanctions on Iran. Abbasi had remarked that “it was unlikely to move ahead until sanctions on Iran are lifted.” Following the cancellation, Iran suggested that Pakistan looked to “third parties” for financial assistance, originally suggesting European companies as a source of possible financing for Islamabad (the United States and Saudi Arabia, two of Pakistan’s traditional allies, did not offer assistance given Iran’s position as the counter-party in the project). 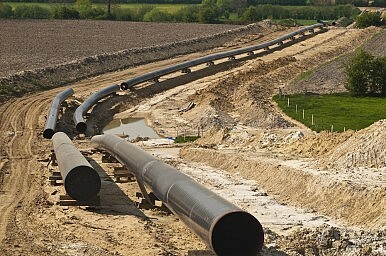 Beyond the financial and infrastructure issues inhibiting the completion of the pipeline, independent analysts suspect that the pricing structure that Iran is offering Pakistan for natural gas access via the pipeline is actually disadvantageous to Islamabad and skewed in Tehran’s favor. As I wrote in 2013, “Iran is importing gas at the price of $4/MMBtu [million British Thermal Units] from Turkmenistan, a price which is uncorrelated with prevailing global prices for oil. In its exports to Pakistan, Iran has pegged the price at $14/MMBtu — a price that is periodically revisited and updated in line with market conditions.” A report by the Sustainable Policy Development Institute described the financial implications of the pipeline as a “death sentence for Pakistan’s economy,” adding that it was “unfortunate on behalf of Pakistan who has blatantly ignored the energy dynamics and its pricing while going for this deal.” Adding to Tehran’s advantage, the rate at which it imports natural gas from Turkmenistan was reported as 250 percent below the price at which it will sell gas to Pakistan. For China, making this pipeline happen will add to the geopolitical heft of its New Silk Road initiative, which opts to increase infrastructure connectivity between eastern and western Asia. The Pakistani section of the pipeline will intersect Gwadar where China maintains an important presence. If China is looking for alternative, non-sea-based routes to extract Iranian natural gas, it could integrate its Karakoram highway corridor with Gwadar, bringing Iranian natural gas to China without the use of vulnerable sea lanes. Additionally, in the broader geopolitical tussle between the United States and China, the Iran-Pakistan pipeline’s eventual completion will be a net negative for Washington. Leaving aside the issue of nuclear sanctions against Iran, which may well be lifted in the event of a comprehensive nuclear deal this summer, the U.S. has encouraged Pakistan to fulfill its energy needs from Tajikistan, via Afghanistan’s Wakhan Corridor. Pakistan ignored the U.S. proposal and moved ahead with the Iranian option, underlining Islamabad’s interest in the project. After years of gridlock and failed planning, it appears that China’s checkbook is the sorely needed deus ex machina for this pipeline. Geopolitically, Iran, Pakistan, and China all see major benefits in the successful conclusion of this project. The problems have always come down to the nuts-and-bolts of finance and capacity, primarily on the Pakistan. With China’s proven record of successfully spearheading infrastructure projects abroad, this should be less of a concern. Still, don’t hold your breath for this pipeline just yet. Meanwhile, Pakistani government officials suggest that Chinese bureaucracy is slowing down CPEC implementation.